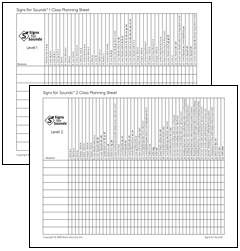 How To :: Signs for Sounds: Assessing/placing students :: Read Naturally, Inc. The Signs for Sounds assessments can also be used to quickly screen a whole group of students for possible weaknesses in phonics. You can use these results to identify students who may need further assessment in decoding. The Signs for Sounds assessment packet includes assessments for both levels of Signs for Sounds (1 and 2). The two assessments serve the same purpose; however, the formats for the two levels are different. Students can be tested as a group or individually. Each assessment is designed to be administered in three sessions, and for most groups, this format will provide the most valid results. However, some groups can be given the entire assessment in a single session without becoming tired or frustrated. The teacher may terminate the test when he or she is certain that the remaining words are too difficult for all of the students. Estimate the skill range of the students you are assessing, and choose the Sounds for Sounds assessment at the level that best matches your estimate. If some students make very few errors on the level 1 assessment, administer the level 2 assessment. Conversely, if some students perform very poorly on the level 2 assessment, administer the level 1 assessment. Distribute the assessment forms to the students, and direct them to write their names and the date on their papers. Dictate the first word: say the number, say the word, use the word in a sentence, and repeat the word. Each student should write the word in the space with the corresponding number. Repeat step 2 for the rest of the words until the assessment is complete. If you are using the assessment for level 1, tell the students to fold their papers on the dotted line before starting each new word list so that the previously spelled words are out of sight. If you are giving the assessment over multiple days, collect the student assessment forms at the end of each session. Use the following information to score the assessment for the level you administered. Mark each error on the student's assessment form, and write the correct letter(s) above each error. List any vowel errors in the vowels column to the right. List any consonant errors in the cons. column to the far right. 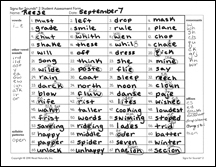 Similar phonics elements are placed across each row in the word lists, so it is easy to identify regular spelling patterns a student has not yet mastered. Line up the assessment directions with the student's assessment form to find the lessons that correspond to the errors. 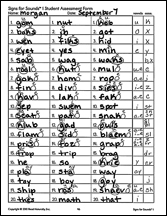 The additional set of tables at the bottom of the assessment directions lists the consonants and the corresponding lessons in which each consonant first appears. List any vowel or syllable pattern errors in the column to the left of the words. List any consonant errors or errors that involve adding affixes to the words in the column to the right of the words. Line up the assessment directions with the student's assessment form to find the lessons that correspond to the errors. When analyzing the errors, notice how the featured element(s) are highlighted on the assessment directions. Consonant and syllable patterns tested are underlined. Vowels tested are bold. Endings tested are in italics. If a student makes many errors throughout the assessment, place the student in level 1. If a student makes no errors or very few errors, administer the level 2 assessment to determine whether level 2 is more appropriate. If a student makes some errors on short and long vowels, consonant blends, and digraphs and makes many errors scattered throughout the rest of the assessment, place the student in level 2. If a student makes many errors on short and long vowels, consonant blends, and digraphs (numbers 1–16), administer the level 1 assessment to determine whether level 1 is more appropriate. Class planning sheets included in the assessment packet help you organize and plan instruction. Enter the names of the students and mark the lessons that correspond to each student's errors. Use a class planning sheet for the whole class, or to differentiate instruction, form small groups of students with similar needs and use a separate sheet for each group. On the class planning sheet, you can place students at the beginning of a level or identify another starting lesson within the selected level. Begin instruction with the first lesson that reflects a student error. Teach all of the lessons from that point to the end of the level. If students do not need a specific lesson, skip it. If a student will be receiving individualized instruction, teach only the specific lessons that correspond to the student's errors on the assessment. You can also use the Signs for Sounds assessments to monitor student progress and as a pretest or posttest. At any time throughout the program, students can be tested on the items that correspond to the lessons they have completed. For example, if a student has finished all of the lessons in Signs for Sounds 1 that teach short vowels and long vowel-silent e, administer the portion of the Signs for Sounds 1 assessment that includes those words. The results can be used to confirm mastery of those elements before beginning the lessons that teach consonant blends. If students have difficulty on any skills, repeat the corresponding lessons. When you use the Signs for Sounds assessments as a pretest and posttest, you can compare results to measure improvement. If students continue to have difficulty on any skills, reteach the corresponding lessons.